An age-restricted community is a residential community, often gated, that typically limits 80% of the residency to individuals who are over a set age. The minimum age is frequently set at 55 years old, but it can vary. These communities are set up to accommodate older individuals who would like to live in an area without the perceived problems of having children around. In most cases a younger spouse or significant other is permitted to live in the community as long as one member meets the minimum age requirement. 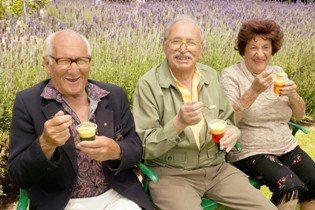 Age-qualified communities, also known as 55+ communities, active adult communities, lifestyle communities, or retirement communities, are often planned communities that offer homes and community features that are attractive to 55+ adults. These might include a clubhouse or lifestyle center with a good many activities, sometimes with indoor and outdoor swimming pools, exercise facilities, craft rooms, demonstration kitchens, and decks and patios for gathering.